1. Fat was never wasted. Scraps of fat were kept from everything they could be and stored. Fat from meat was cut off to be used to fry and roast. Bacon grease was kept in a jar to be used to cook eggs and potatoes. Fat from cooking meat was reused in cooking other meat and cooking vegetables. Fat was too precious to waste especially when it became severely rationed during World War II. 2. Cooking liquids were never just thrown down the drain. That was wasteful! They were reused in cooking for vegetables. Rice and pasta could be cooked in water that was previously used in cooking vegetables. They also thought it gave the rice and pasta flavor. They would also use the cooking liquids in watering plants and feeding animals. 3. Leftover meat juices had so many more uses! Leftover meat juices were used for making soup, cooking rice and pasta, flavoring casseroles and skillets dishes. Meat juices were poured into a jar to be reused in the next meal. 4. If the food has to be imported into the country, chances are you would have to live without it. This was especially true in the United States and Britain during wartime when most of their food was imported into the country. Many things they could grow themselves, but items like sugar and coffee were severely rationed because they could not produce it themselves. 5. If people could, they raised their own chickens and planted gardens. Sometimes city dwellers could not have gardens, but many cities had garden allotments for people to use. Raising your food could mean the difference between living and starving for most people. Many people during the Depression and wartime sold the food they couldn't eat or preserve. Many women sold eggs from their chickens in order to bring a little more income into the home. Many people from these eras have said that having gardens and eggs is what got them through the lean years. 6. Leftovers were not wasted. Leftovers were generally incorporated into the next meal or the next day's meals. Leftover meat became chopped meat sandwiches. Leftover meat and vegetables became part of the soup. Cooking liquids and canned liquids were reused. Nothing was wasted. If for some reason, the leftovers could not be or were not used, they were fed to the animals or put into a compost pile. 7. If you did not raise or hunt your own meat, meat could be very expensive. 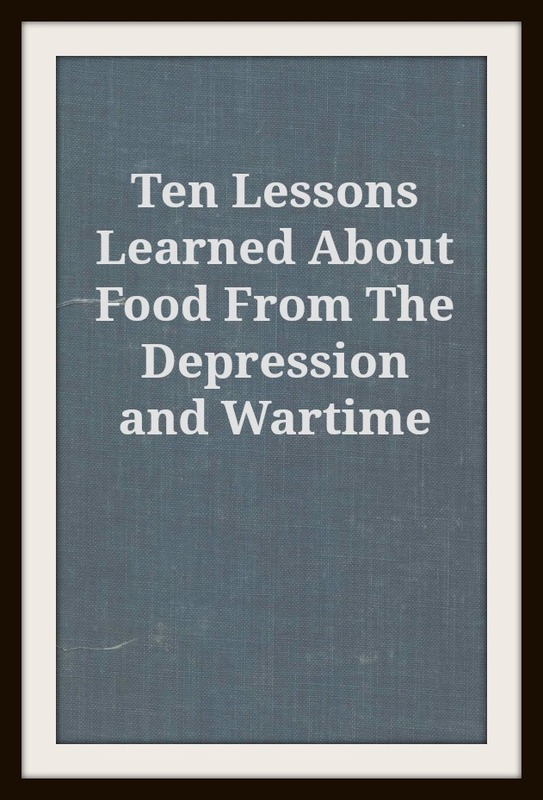 Meals in the Depression and wartime were not heavy on meat like they are now. Meat cooked at one meal was stretched over 2-4 meals. They might roast a chicken for one meal, make chopped meat sandwiches for another meal, soup for lunch or supper, and use the rest of the chicken in a white sauce served over toast or pasta. The bones would be used to make broth for the soup before being thrown out to the chickens. Nothing was wasted. 8. Consider alternative ways of cooking food. In the 30's and 40's, cook stoves were popular. Electric and gas cook stoves were becoming increasingly available and were cheap to run. However, in the Depression, people could not afford to run the stoves. During the war, gas was rationed. Women used wood stoves and hay boxes to cook food and save money. 9. Forging was very necessary during these eras. People looked for dandelion greens, dug up wild onions, and knew where to find blackberries in the brambles. Forging for anything edible helped at the supper table and, for some families, made the difference between a very meager meal and a decent meal. 10. "Making Do" was the theme of the Depression and wartime. People didn't have a choice if they wanted to eat. Beans were eaten a lot because they were cheap and nutritious. Casseroles were made more and became popular because little bits of food could be mixed together to make a more filling meal. Bits of dried fruit and sweet vegetables were used to sweeten food when sugar wasn't available or heavily rationed. Food was never thrown out or wasted. People became very creative and resourceful to make a meal for their family. They had to. They didn't have a choice unless they wanted to starve.